Tracey Kershaw is based in Nottingham. She studied Fine Art at the University of Nottingham, and since graduating in 2011 has been developing her practice, which focuses on aspects of the maternal, including her evolving relationship with her son. The profound and often overwhelming emotions that her motherhood brings have driven her to engage with other interrelated subjects such as fertility, ageing and the fragility of time passing. 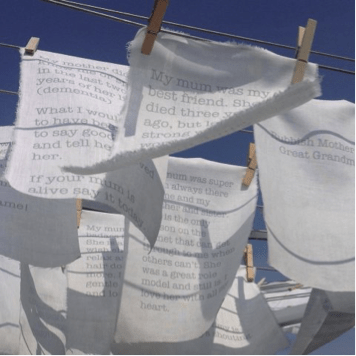 After creating and exhibiting a number of maternally-themed works, Tracey undertook a one year residency at the University of Nottingham in 2012/13, and used this time to start developing her current project ‘tell me about your mother’. 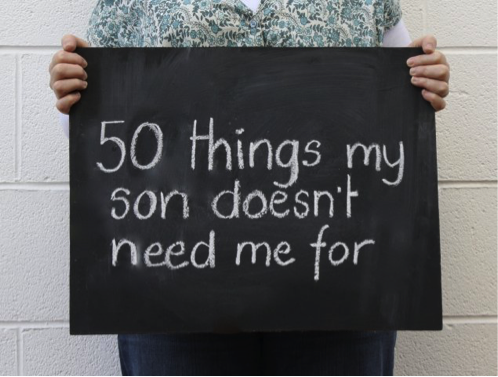 While her early work focussed mainly on her own relationship with her son, this project takes a less introspective direction, aiming to both celebrate and expose the powerful, yet often problematic, relationships between mothers and their children. My work is about motherhood. I’m interested in maternal emotions, and the mother/child relationship. Initially this focus on the maternal was inspired by the birth of my son, and my work was about my experience of being a mother, and in particular my changing relationship with him. More recently, I’ve been taking a less introspective direction, and have been exploring the relationships between mothers and their children in a more general sense. I always wanted to be an artist from a very young age, and have been involved in the arts in some form or another since my teens, even managing to find ways to incorporate art into some of my non-art occupations! However, it’s only since the completion of my Fine Art Degree in 2011 that I’ve had the opportunity to practice full time, and I now work from my studio at Backlit. What is the most interesting/inspiring thing you have seen/been to over the last month, and why? At the Eisteddfodd in August I watched a film collaboration by artist Sean Vicary and musician Ceri Rhys Matthews. Made following the death of Vicary’s father, ‘Lament’ explores personal feelings of loss, and incorporates sound, animation and poetry along with beautiful footage of the Welsh landscape. I found the film completely absorbing, and wonderfully poignant and evocative. Also, shortly before, I participated in an international interdisciplinary conference in London called ‘Motherhood in creative practice’. Two days of discussions, presentations, performances and film screenings left me feeling genuinely inspired. It was fantastic to connect and engage with so many diverse artists, curators and theorists from around the world. A selection of my work can be seen online at http://traceykershaw.co.uk. 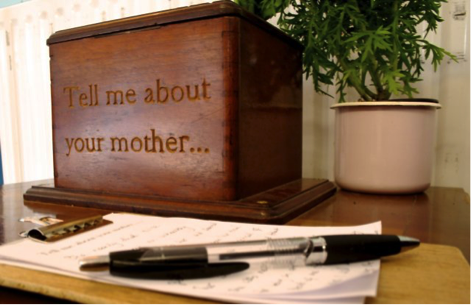 I also have a Facebook page which documents progress on my latest project ‘tell me about your mother…’. I co-curating Artist as Mother as Artist, an exhibition at the Lace Market Gallery in Nottingham with the gallery director Sam Rose. This will bring together a collection of work by artists whose practice is based upon the inseparable relationship between being an artist and mother. Tracey was first interviewed in September 2015. Contact us if you would like to take part in Meet the Artist.